So this little gem came across my Google alerts today. Two RealMenTM are spearfishing in the pelagic zone. You know, where whale sharks live. To aid in their quest to bag a tuna, our intrepid heroes chum the water with a bag of cut fish. One curious tuna flirts with death, but is saved by the arrival on scene of a harmless and curious whale shark: as I said, a well known inhabitant of the pelagic zone and commonly associated with tuna schools. Also, and this is important, with an impeccable sense of smell and a fairly sizable appetite. So, whale shark arrives to investigate the source of that delicious smell, giving Hero number 1 a nudge during his sniff test. Hero number 1 then screams like a horror film teenager. Hero number 2 decides not to take that kind of crap from no stinking planktivore, so he grabs the animals dorsal fin for a ride, in violation of pretty much every tenet of wildlife interaction. Doing that would and should get you summarily expelled from any well managed whale shark ecotourism operation in the world. Animal objects and banks away to avoid the irritation. Aaaaaand scene. So to recap, our two heroes created a situation by going into the whale shark’s habitat with a bag of what the whale shark likes to eat. A whale shark shows up (duh), doesn’t hurt anybody because they don’t, but gets harrassed anyway, and then journalist (that’s Kara O’Neill at the Mirror) beats it up into some sort of horror story in a case of victim blaming par excellence. Let me tell you, if that’s a horror story, then I’m Rob freakin’ Zombie, because I’ve got several similar videos (sans the harassment of course). Every time there has been physical contact between me and a whale shark it’s because I was too stupid or not quick enough to get out of its way; this is an animal the size of a school bus and you need you have your head on a swivel. Hero 1 did not, got bumped, but no harm no foul because the critter is intrinsically harmless. The real foul here is how the incident is portrayed, and that’s what fills me with dismay. How are we ever supposed to get folks to understand, ergo care for, ergo protect marine life if we keep trotting out rubbish like this? The two guys in the video should be ashamed, and so should everyone involved at The Mirror. 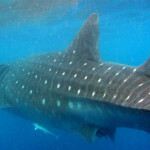 Share the post "ZOMG Whale shark attack!!!! Or not…"
Wow, he was SO terrified of the scary dangerous toothless shark that his friend went and grabbed onto its fin for a ride. I was actually far more concerned for the shark. Seriously, I’ve seen what dumb divers can do to themselves and others with a speargun. My own dive buddy stabbed himself with a spear. I’m terrified…for the shark. Poor thing, just bumbling along, having a happy plankton snack, and all the sudden it’s being harassed by horrendous, disgusting aqua-monkeys.